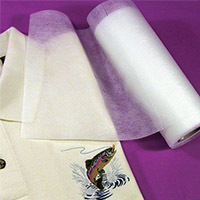 Fusible No Show Polymesh Plus™ is an iron on cut away embroidery stabilizer and backing made from soft nonwoven nylon mesh. Simply cut to size and press on with a dry iron. Use lowest temperature settings (silk, wool, or polyester; 250-260 degrees). Can be used traditionally as an embroidery stabilizer or to cover the back of finished embroidery to prevent itch. It will barely be felt next to the skin. From Katie Wubben of Lake Mills, Iowa on 2/3/2019 . I use this backing in so many ways. Great on lots of polyester performance apparel & lightweight fabrics that are very flowy & otherwise difficult to embroider with great results.